Item #GS-2132: 1.25"x3.75"x 2.75" Rose Quartz goat. 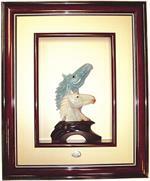 Item #JP-FBQC-10: 5"x7" Blue Quartz double horseheads on 6"x2.25" base in 17.75"x21.5" Mahogany frame. 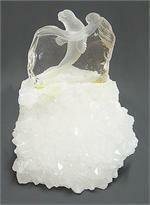 Item #GS-659: 3 1/2"x2 1/2"x5" tall; Transparent Quartz on White Quartz. Item #GS-707: 2 3/4" x 1 1/4" x 1 1/2" tall; Transparent to Translucent Quality with assorted colors of fish. Item #GS-2216: Approx. 3" x 1" x 1 1/2" tall Quartz bear with Rhodonite fish. Item #GS-708: 1.3"x1.3"x1.5" tall transparent Quartz dolphin on frosted Quartz wave with gray felt bottom. 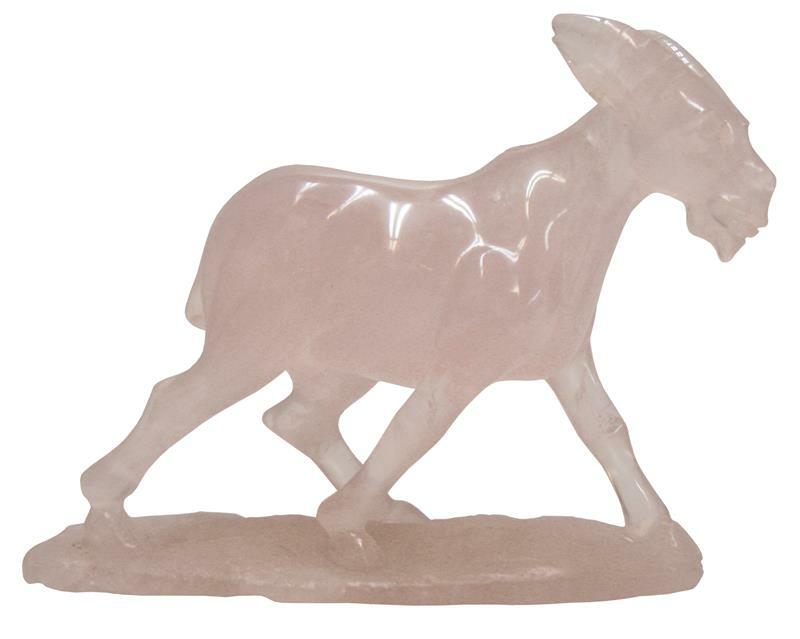 Item #GS-2087: 8.5"x2.75"x4.5" tall Quartz Horse. 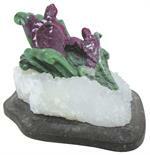 Item #GS-312: 1 3/4" x 5 1/4" tall on 7/8" Black Basalt base. The bottom of the carving reveals the hexagon shape of the natural Quartz crystal from which it was carved, and the upper portion is translucent. 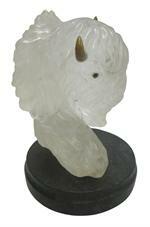 Item #GS-2118: 3 3/4" tall Rocky Crystal Buffalo Bust on a 5/8" stand. 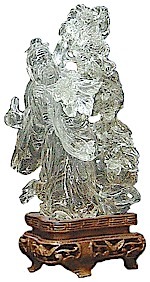 Item #GS-318: 3.25"x5.25" transparent Rock Crystal Chinese Man with Flowers. Mounted on 1.25" tall wood stand. 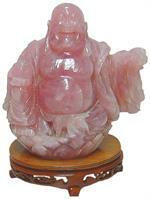 Item #GS-2115: 3.25"x6"x 3.5" Rose Quartz buffalo. 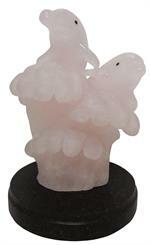 Item #GS-735: 3"x2 3/4"x 4 1/2" translucent, light pink Rose Quartz dolphins and opaque matte finish waves on 3"x1" black basalt base. 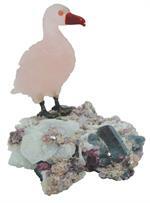 Item #PM-06-10: Rose Quartz family of three flamingos on 4.75"x8" Aquamarine crystal. 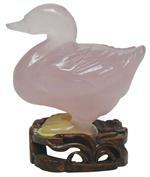 Item #GS-470: 6 1/2"x3 1/2"x7 1/4" Rose Quartz Hoti on 1 5/8" wooden stand. Item #26: 1"x1 3/4"x1 3/8" pink Rose Quartz sparrow with orange Carnelian beak on 2"x3"x1" Black Tourmaline crystal base. 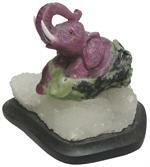 Item #GS-2153: 3 5/8"x3 6/8"x2 7/8" tall opaque purplish Red Ruby elephant on dark green and black Zoisite with 6"x4 1/4"x1" tall Quartz crystals on Black Basalt base. Item #GS-2183: 1 5/8"x2 1/2"x2 1/8" opaque, purplish red Ruby elephant on dark green and black Zoisite with 3 1/4"x2 3/4"x3/4" Quartz crystals on 3/8" black Basalt base. Item #GS-2107: 1 1/2"x2 1/4"x7/8" tall Red Ruby Turtle in Quartz from Tanzania. Item #GS-747: 3.5"x2"x2" opaque, purplish red Ruby turtles on dark green and black Zoisite with 4"x3.5"x1.25" Quartz crystals on black Basalt base. 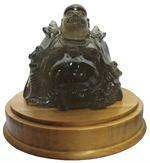 Item #GS-2181: 5.25"x5.25" tall Smoky Quartz Buddha; 6.34 lbs. 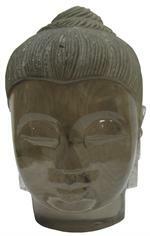 Item #GS-2176: 7"x10" tall Smoky Quartz Buddha Head; 19 lbs. 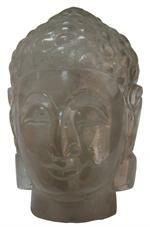 Item #GS-2179: 3.75"x6.25" tall Medium Dark Brown Smoky Quartz Buddha Head. Item #GS-761: 3.25"x2"x2.5" tall, transparent to translucent light Brown Smoky Quartz Crystal with Seal internal carving. 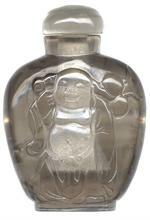 Item #GS-141: 2"x3" light brown Smoky Quartz snuff bottle with Hoti design. 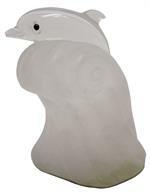 Item #GS-155: Tourmalinated Quartz Squirrel in Matrix Carving. .8"x2.75"x.75" tall Squirrel on a 3"x4"x2.25" tall Matrix.